Has your car lost stopping power? Your brakes keep you and other drivers safe. If you notice dip in performance or hear squealing sounds when you hit the brakes, you owe it to yourself and everyone else on the road visit your local auto shop for brake service. Do You Need Brake Pad Replacement or Rotor Resurfacing? Replacing your brake pads is the logical step when your car isn't stopping correctly, but there's more to the system than a set of pads. The rotors are the other essential components in helping your car stop, and the condition of the rotors has a direct impact on how well your car comes to a halt. Every time you step on your brakes, your brake pads wear out the rotors. Weather conditions and dirt also take their toll, and your rotors could be the source of your problems. When the rotors become a problem, you'll need to either have them resurfaced or replaced. 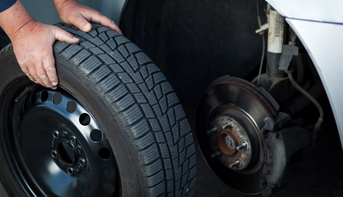 Trust an experienced mechanic to help you maximize the value of your service. Count on our pros when you need brake replacement. We'll perform a full inspection on the system to ensure every problem has been addressed. Naturally, we don't make any repairs without your consent, but you can still expect objectively sound advice regarding your auto safety. Save money when you need brake pad replacement. We offer exclusive savings that save our customers money on essential auto services. We're committed to using only the best parts so we can provide our customers with better service. Contact us to schedule an appointment for brake service. We proudly serve San Antonio, Texas, and the surrounding area, including Helotes, Leon Valley, Pipe Creek, and Bandera.